Now, we tend to use the term masterpiece for paintings … particular those by one of the 'old masters' … but it actually refers to a work made by an apprentice, journeyman or master craftsman to show off their skills. So surely, this chair is a masterpiece by Hans Wegner? It's not exactly flamboyant or even particularly egotistical but it does show a number of real skills and an amazing command of design in three-dimensional space. It takes a traditional type of chair - an English Windsor chair - and shows just how it should be done. The spindles across the back of the Peacock Chair are shaped and flattened at the point where the shoulder blades of a person in the chair would rest but they extend in an arc out to the side spindles so it is also decorative. They resemble the 'eyes' on the tail feathers of a peacock and the name was soon applied to the chair. It is a wide chair with a relatively low seat so this is an easy chair rather than a dining chair. The seat is paper cord and at first glance it appears to be the traditional pattern with the cords taken across the seat and across the underside with their intersection forming a diagonal cross but on most chairs the cord is taken completely over the rails of the seat but here the wood pieces of those rails are unusually wide with a narrow slot along the centre with the spindles of the back housed in the outer part of the seat frame and the cords of the seat taken across and down the slot before returning on the underside. It is only across the front rail of the seat and at the front ends of the sides - in front of the vertical supports of the arm rests - that the cords are taken across the whole width of the side rail in the area where someone would put their hands down to steady themselves as they stand up from the chair. The legs of the chair are turned and are housed in holes that go right through the frame of the seat where the end is cut and split with a wedge in dark wood to hold the leg in place. There are side stretchers between the front and back legs and a cross stretcher between them forming an H shape below the seat. There are paddle-shaped arm rests and these are supported on diagonal struts that run down through the seat and inwards to be housed in swellings at each end of the cross stretcher. 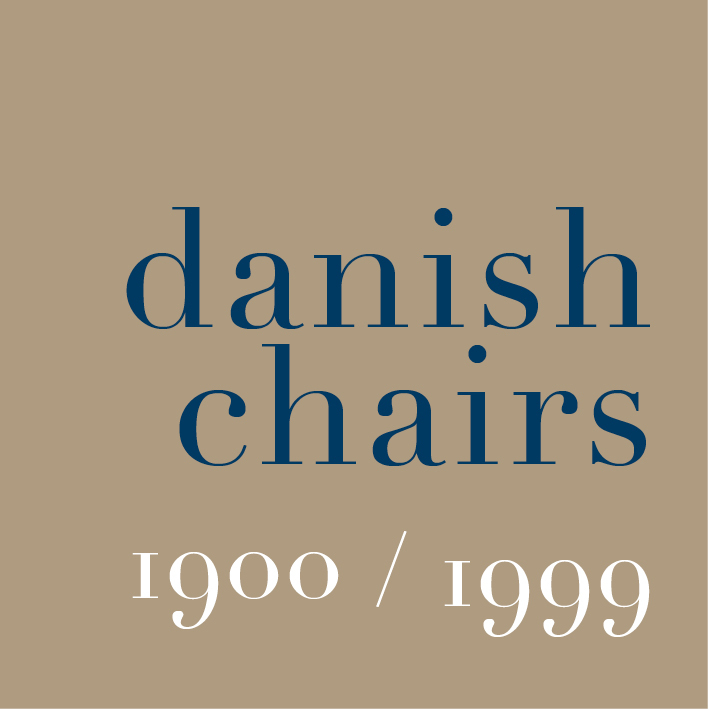 The chair was shown by Johannes Hansen at the Cabinetmakers' Exhibition in 1947. It is interesting that despite the design of the chair - with its origin in an historic form - the style of the room is much more modern than the room setting from Hansen with furniture by Wegner that was shown just a few years earlier. This room had a fairly traditional sofa but a good simple coffee table in wood and a version of a square-sided Windsor Chair with ramped arm rests** all set around a rush mat and there were fitted book cases rising the full height on either side of the window and, opposite the sofa, a long range of three units … one a desk with drawers, one unit with narrow drawers and one with a double cupboard and above what appears to be a hanging system with glass-fronted display cabinets and what looks like hessian on the walls. * The area of Berkshire north of the medieval town of Windsor has chalk hills - The Chilterns - that were covered with beech trees. Men would work out in the forest with temporary or moveable lathes and would cut and turn the spindles, stretchers and legs for chairs and these would be brought down into the local towns - Windsor or High Wycombe - where they would be made up into chairs with seats made elsewhere and often from very different wood so usually elm but sometimes oak or sycamore and with the bow made in ash or even yew. The chairs were often quite simple and are sometimes called country chairs and were bought for inns, farmhouses and cottages but could also be quite elaborate and expensive pieces of furniture. It was not a common Danish form … Axel Steensberg in his book on Danske bondemøbler shows just one example from Fyn and that has a bow back but shaped splats rather than spindles. 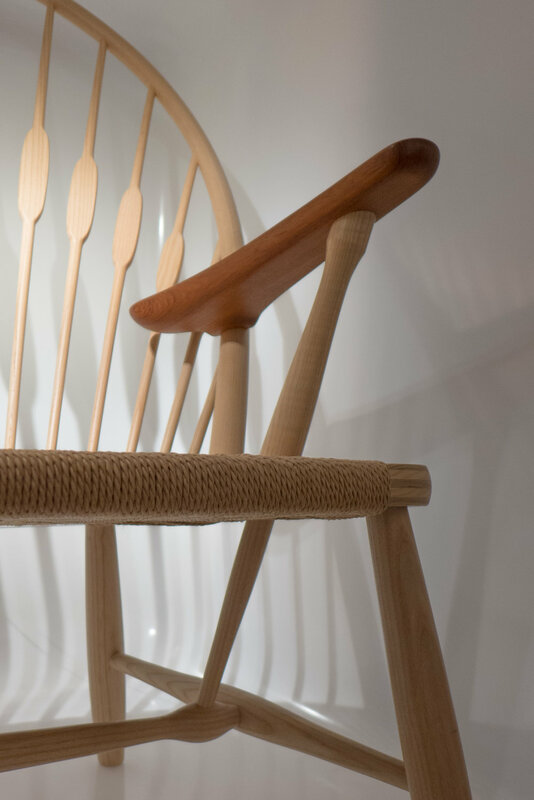 Kaare Klint used an English example of a Windsor chair in the collection of the design museum for teaching.